Some women have shoes, jewelry, or handbags to accessorize. I have tattoos and glasses. The first thing people notice may be your outfit but the one they'll mostly remember is your face. No, I don't have tattoos on my face but I do wear different glasses often. I discovered Rivet and Sway on Pinterest. I've had it on my wishlist for months and couldn't wait to order them. Navigating their site was easy, and even if I knew which pair to order, I still wanted to check out what they have. I ordered the Neapolitan Punchline. They were quick to reply by email and contact my optometrist office that hour. After contacting me for my PD number, I was surprised I wasn't asked to pay extra for my legally blind prescription. I normally pay up to $30 extra for high-lens index (also known as, not having coke bottle glasses fee) for other popular glasses companies. My fee was included, along with a friendly banter of emails with the service rep. I have blogged about other companies either for sponsorships or just because I truly loved them. When I do find a company I have a great experience with, it's something I want to share with everyone. Rivet and Sway is one company I really love and I hope you guys have the same experience I had. Plus, how beautiful is their packaging?! Rivet and Sway loved the post (thanks, guys!!!) 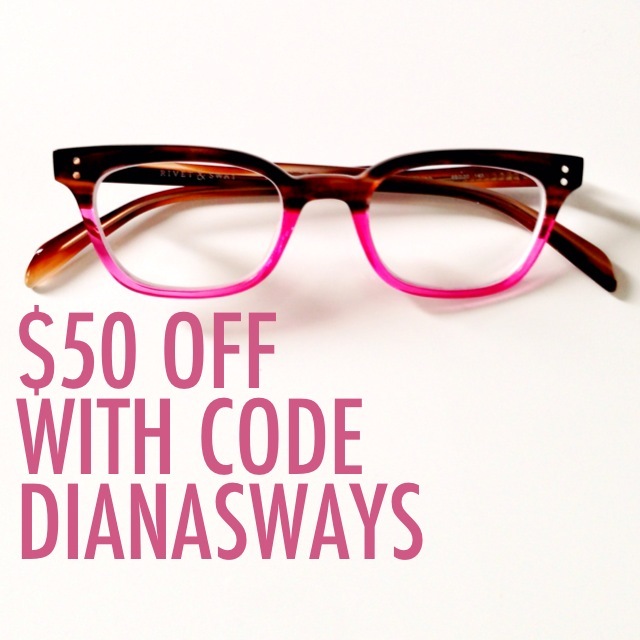 and are offering $50 OFF with any purchase of glasses you love, including prescription, with code DIANASWAYS (how cool!) If you get your new specs from this blog post, send me a link and I'd love to check it out.